Included as part of the set are the Mint’s five 2018-dated America the Beautiful quarter dollars, each struck to proof quality from 90% silver and 10% copper. The five coins contain reverse (tails side) designs honoring national sites in Michigan, Wisconsin, Minnesota, Georgia, and Rhode Island. All five appear together in one protective lens and ship in an illustrated cardboard sleeve with pictures of the national sites honored. This set is similar to the clad version released in January (see a photo of it below). 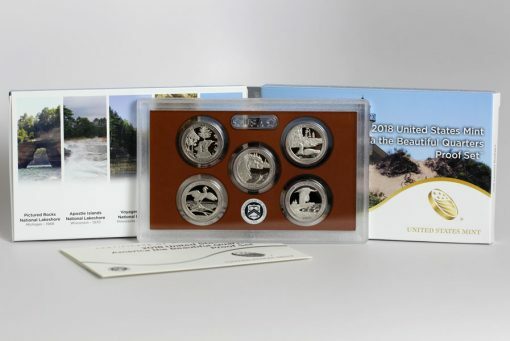 This CoinNews photo shows the coins, lens, certificate of authenticity, and packaging of the clad ATB Quarters Proof Set that was released Jan. 23. 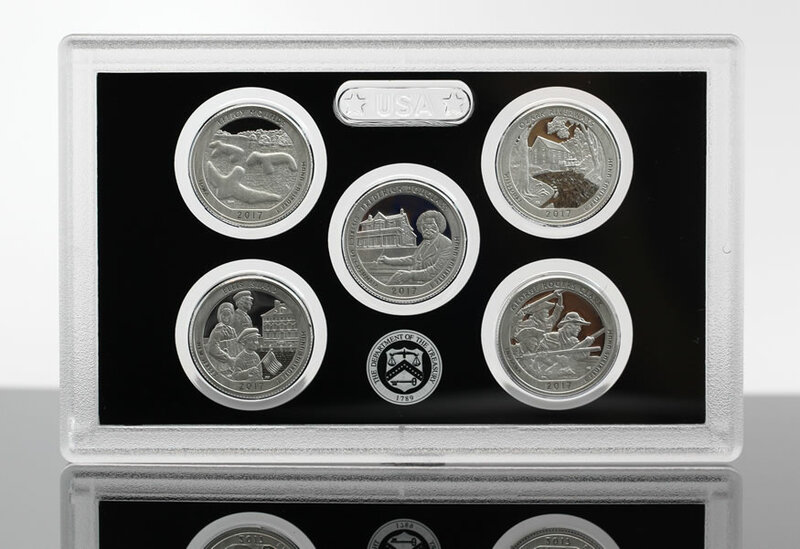 The set released today features the same quarters in proof quality but they are minted in 90% silver. However, that set has coins with identical compositions to their circulating counterparts whereas the coins in this release are silver. All are produced at the U.S. Mint’s facility in San Francisco and carry an ‘S’ mintmark. 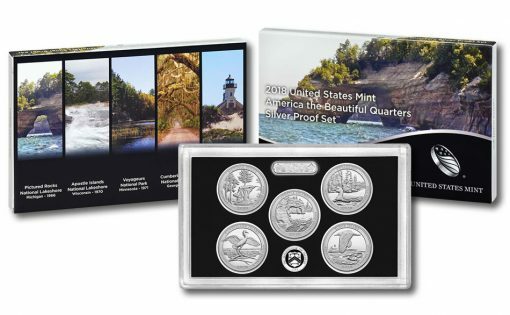 Each of these are issued as part of the U.S. Mint’s America the Beautiful Quarters® Program which first appeared in 2010. Since then, five new quarters have been released annually with each honoring a different site of national interest. This CoinNews photos shows last year’s set of five silver proof quarters held within a protective lens. This year’s silver quarters are similarly packaged. The obverse (heads side) of each program coin depicts John Flanagan’s portrait of the first President of the United States, George Washington. When added together, the five 90% silver coins have a total silver weight of 0.904 troy ounces. Other than their composition, they feature similar specifications to their circulating versions including a diameter of 0.955 inches, or 24.3 millimeters, and a weight of 6.250 grams. America the Beautiful Quarters Silver Proof Sets may be ordered from the U.S. Mint’s annual proof sets page. Customers may also buy them by calling 1-800-USA-MINT (872-6468). No mintage, ordering or household limits apply. 90% silver…whats up with that. They are proof and not circulation. No need for the durability of a lower silver grade. 9999 silver needed. I agree totally! The U.S. Mint got approval last year to produce any silver coins in higher than .900 fine (traditional “coin silver” here in the USA going way back to circulating silver coin days). And, on this set which has been $31.95 for the last couple of years (and overpriced already!) the Mint had the nerve to raise the price by $2 up to $33.95 this year. Asinine! I’m not sure why the U.S. Mint ever got involved in the business of minting bullion other than as another classic example of the bastardization of the American economy into a defacto socialist-capitalist amalgam. Besides, aren’t there already more than enough private mints in existence – plus those that would be given the opportunity to emerge as further competitors – to crank out a sufficient quantity of rounds, ingots and bars to satisfy popular demand? A U.S. Mint concentrating solely on the businesses it was originally supposed to be in, which is the production of circulating coinage for the general public and of highest quality products for collectors, would be able to successfully operate as a much more focused, precision oriented and imagination driven enterprise. Good for you for lending your support to the private sector and the “little guy” who so often is the most reliable source of numismatic collectibles. It would be truly awesome if many more stackers and/or collectors adopted your type of enlightened consciousness and followed that same ever so supportive approach to allocating their financial outlays for bullion and collectible coinage! I concur wholeheartedly on the need for the U.S. Mint to cease and desist in its overtly arrogant price-gouging approach when it comes to the sale of numismatic products. Let’s face it, if that Mint couldn’t count on a near monopoly regarding the production of bullion it would have to be a heck of a lot more circumspect and as a consequence more thoughtful and considerate when it came to the (one would only hope fair) pricing of numismatic-grade coins. Greetings Old Collector – if you have not checked out Art Mint (small boutique mint located in Paris France) I highly recommend it. Their numismatic products are a bit pricey, but truly individual pieces of art work / that balance between art and currency. I have recently purchased their 3 coin Celestial Bodies series. They produce their work on a 2 ounce platform / each coin is struck to a high relief and obtains a minimum of 3 hours of personalized hand work before completion. When I purchase numismatic coins now, they have to be of a minimum silver or gold content / bullion grade / possible future historical significance / stunning design and craftsmanship of the highest quality. Give this mint a look / you wont be disappointed. Smaller mints do have the ability to compete in the international market and produce product of the highest quality. As always, thank you for the very thoughtful recommendation. I did manage to take a good look at the Art Mint, and while it is everything that you said it is, the prices of the items for sale there are – as I perhaps somewhat expected they might be having some knowledge of that kind of specialized mint from previous numismatic web travels – unfortunately way out of my league. The fact is that Social (In)Security disbursements are in all honest not actually all that conducive to a lifestyle which extends anywhere near up to that level. All the same, I’m still very happy and more than grateful to have it as an income stream, as the alternative would be too bleak to even contemplate. Carpe diem.